"Malevolent eyes watched the Northmen fill their ship with stolen gold. They had come from the frozen North, these reavers and raiders, slaughtering the priests of the Nailed God. What they couldn't know is that here the fat priests had built their refuge on a place of older, deeper magic; a place dedicated to Donn, the Dark One, Lord of the Dead." In order to test-drive my new "Revenant" faction of zombies for Saga, I recently hosted a game for two friends of mine. Konrad (a police officer) took command of the Vikings of Gaukur Trandilsson, and Matthew (a defense counsel) led the Revenants. I was to act as referee, bartender and official photographer. 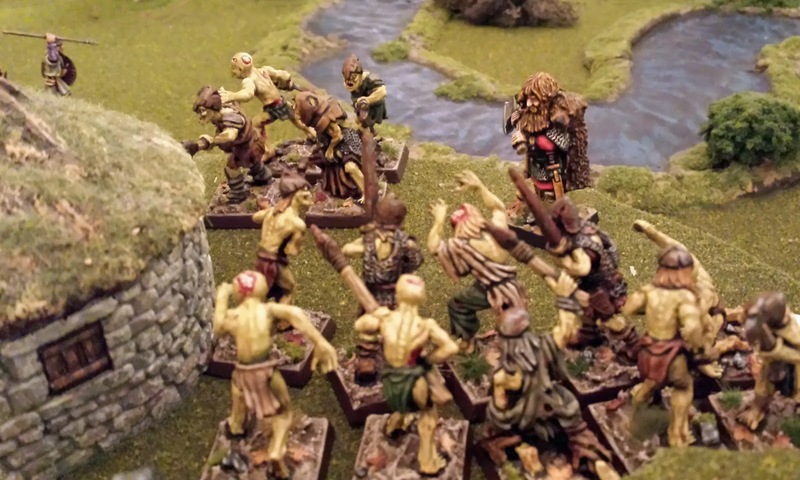 What followed was an evening of slaughter and tactical daring worthy of Ragnarok itself. For our battle, we chose Get to the Longship, which is the scenario included in the Saga Revenants set. A Viking warband has raided a defenceless monastery on an isolated island. What could be more right and proper? But unknown to the Northmen, the rites of the priests had been keeping back an ancient pagan evil. Freed from these holy constraints, the Necromancer and his walking dead rise and attack the nearest living things -- in this case, the loot-encumbered Vikings. In this battle, the Vikings must escape from the pillaged church (at the North end the board) back to their longship at the South end. 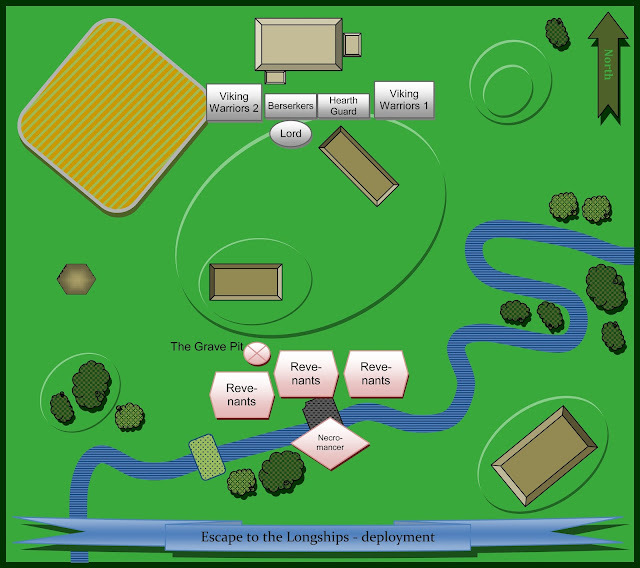 (Because I lack a longship, we symbolized the escape by requiring the Vikings to cross a tidal river). They get victory points getting their units off the board, and extra points if they make out with special tokens representing their looted treasure. But the more loot a unit carries, the slower it will move. One of my favourite things about Saga is how claustrophobic the game becomes. Although were were playing on a table measuring 48" by 36", it seemed much smaller, especially since both warbands decided to deploy in the centre of the table. The only thing separating them was a low hill crowned with a couple farmsteads. 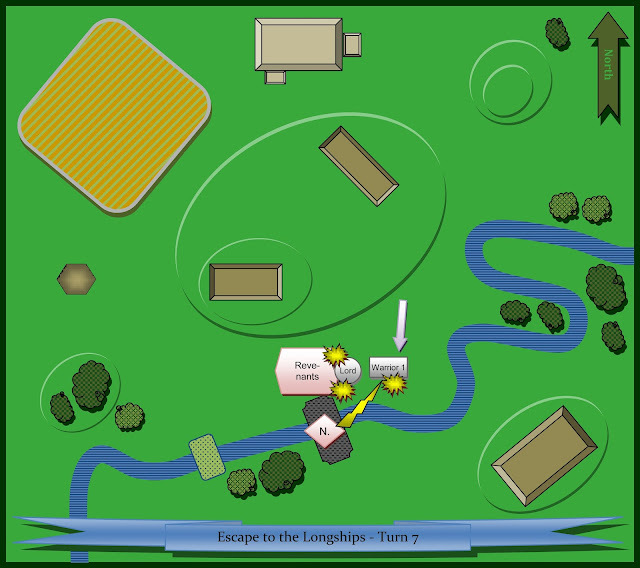 Although they were so close, this terrain would force both armies to break up their lines of battle. 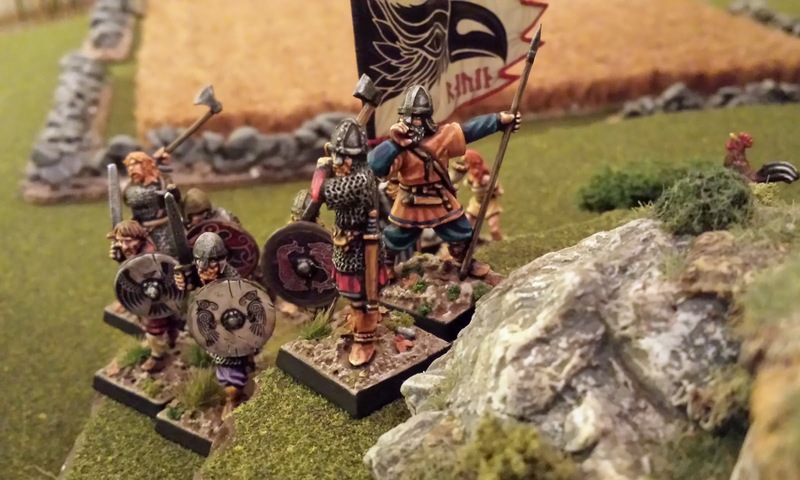 Strictly speaking, the Revenants had the first turn, but they used this move to do nothing but gather Saga dice and ready their special powers -- so I've written the report as if the Vikings had the initiative. 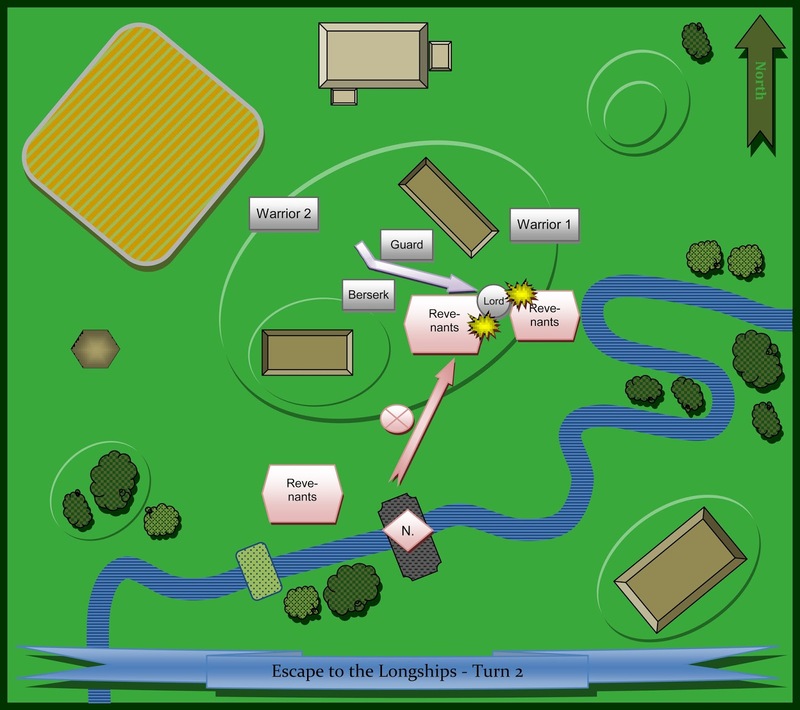 Sensing danger but unsure of what they face, the Vikings advance cautiously into the central farmsteads. 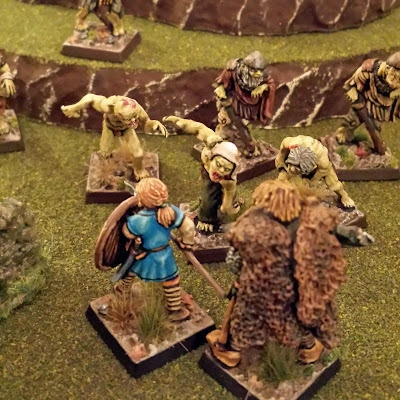 They catch sight of the seething mob of corpses and are struck by "Bowel Loosening Terror", one of the special abilities that the Revenants can trigger using their Battle Board. This gastrointestinal assault requires the Vikings to choose between becoming fatigued or empowering the Necromancer with "dread tokens", which he can use to trigger other Black Arts (I love the way one side's special abilities in Saga often force the other player to make ugly choices). On his turn, the Necromancer perceives a weakness in the Viking line: a unit of warriors isolated on the eastern side of the village. He launches one of his units in a surprise attack by triggering "Winged Death", a special ability that transforms his slow-moving shamblers into very fast zombies. Three of the eight warriors fall in the swift assault, but they fend off the ravening monsters. Now it looks like the tables have turned. One of the units of Revenants is battered and isolated. How will the Vikings capitalize on their advantage? 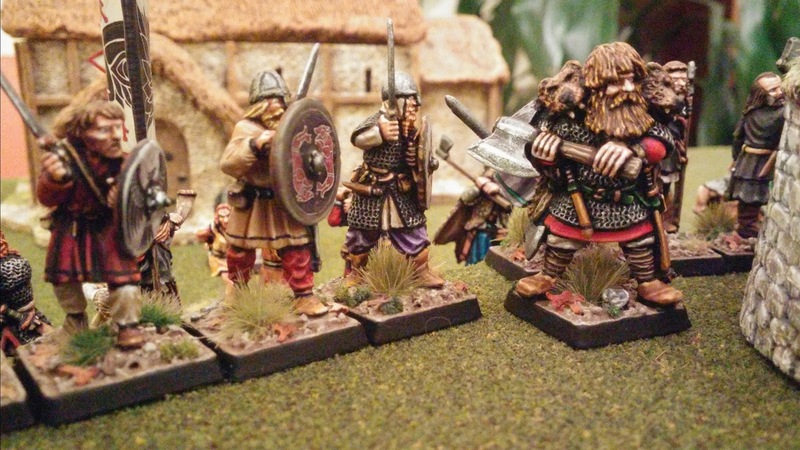 Seeing his chance, the Viking Warlord takes command of the nearby Berserkers and charges the lone Revenants. However, by triggering Bowel Loosening Terror and fatigue, the cunning Necromancer holds the Berserkers back so that the Warlord goes in alone. Nevertheless, the mighty Viking Lord invokes Heimdal's blessing and strikes down 3 more Revenants. Hoping to bring down the Warlord, the Necromancer casts another unit into the fray by invoking Winged Death. 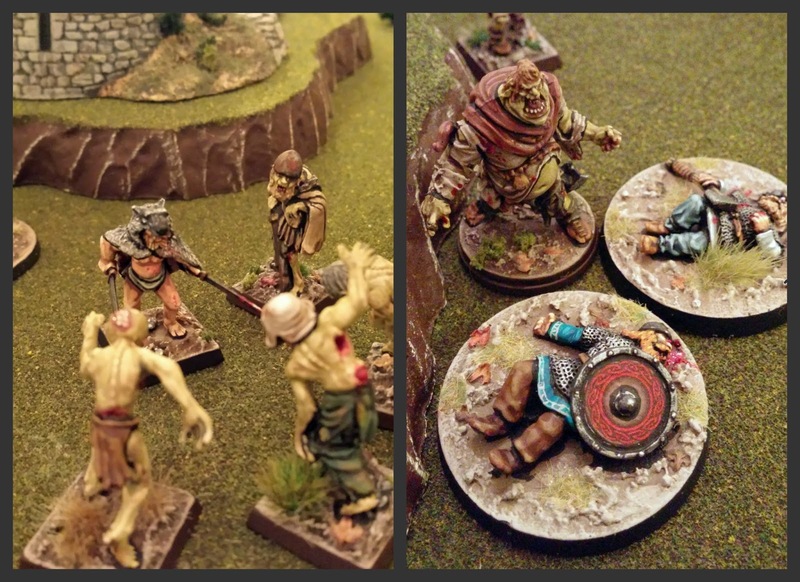 These surging undead inflict horrible wounds on the Warlord, and only the sacrifice of 2 nearby Berserkers keeps him from falling under the weight of numbers. But even with this desperate defence, the Warlord is pushed back and further cut off from his men. At this point in the game, both sides seemed vulnerable. 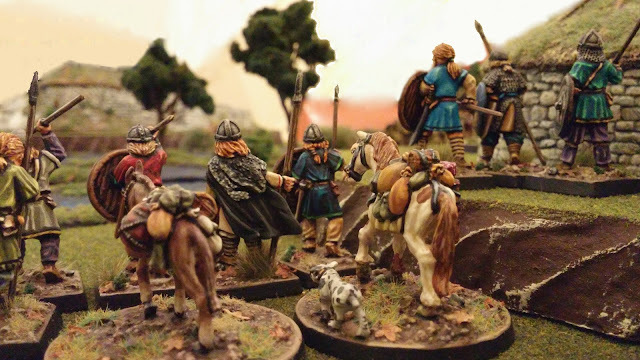 The Viking Warlord is cut off from his men. But the Revenants have been running into the fight in piecemeal fashion, and are getting defeated in detail. Turns 3 & 4 - Hold the Line! 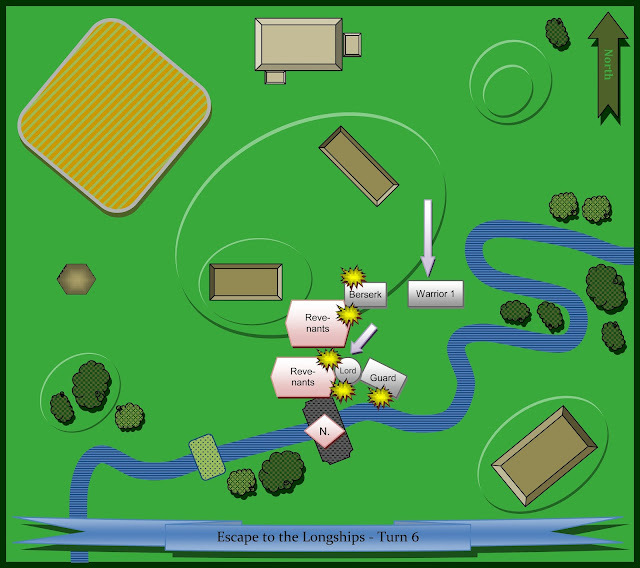 The next two turns passed quickly as both sides attempted to consolidate their position. The loyal Hearthguard charged toward their leader and cooperated with him in wiping out one unit of Revenants. 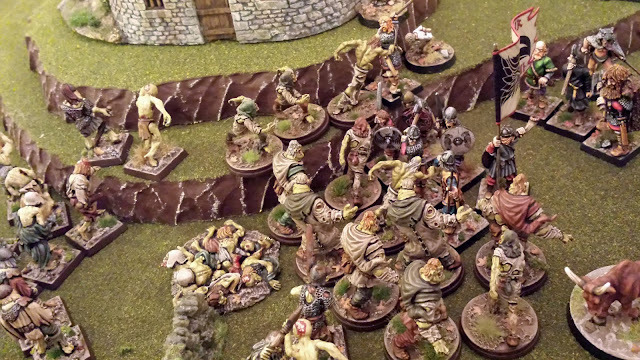 At their side, the two remaining Bersekers fare much worse -- they plunge into the second unit of zombies but only destroy one due to the Necromancer's lucky saving throws. 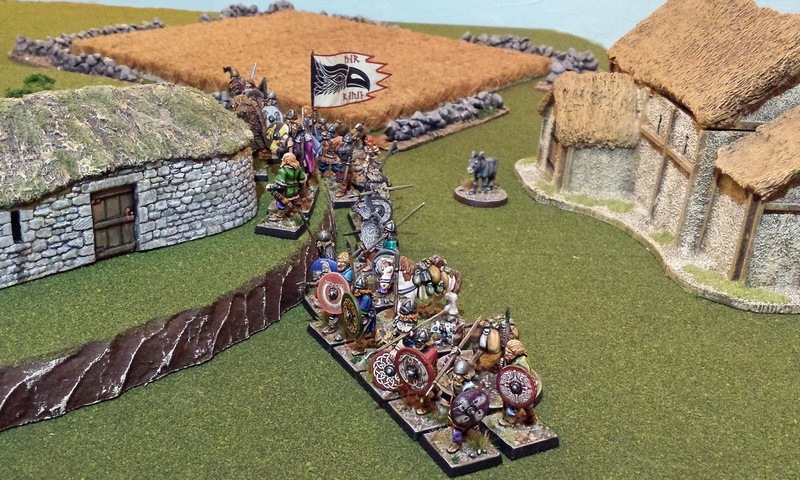 As the Vikings rally, the Revenants pull back to the river, hoping to concentrate their depleted forces. 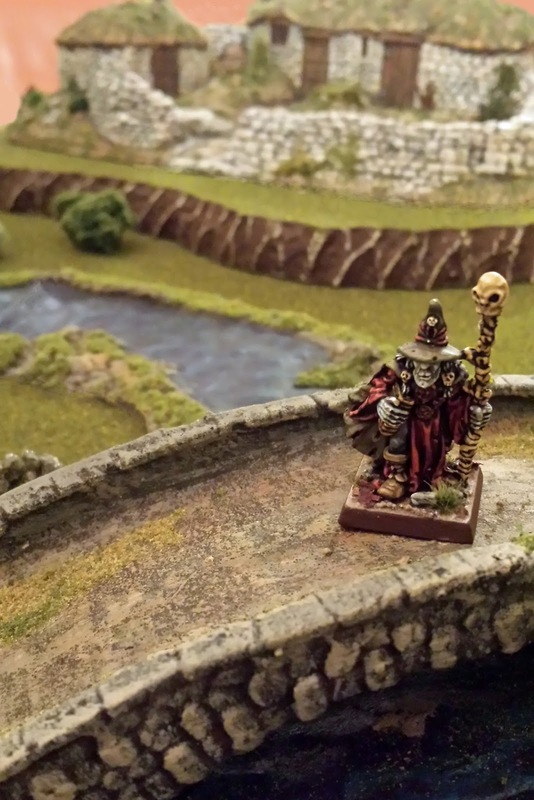 From the crest of the bridge, the Necromancer uses his mystic powers to slay a couple Viking Warriors from afar. He's the only unit in the battle with any missile attack, so he can make the Northmen pay if they keep their distance. 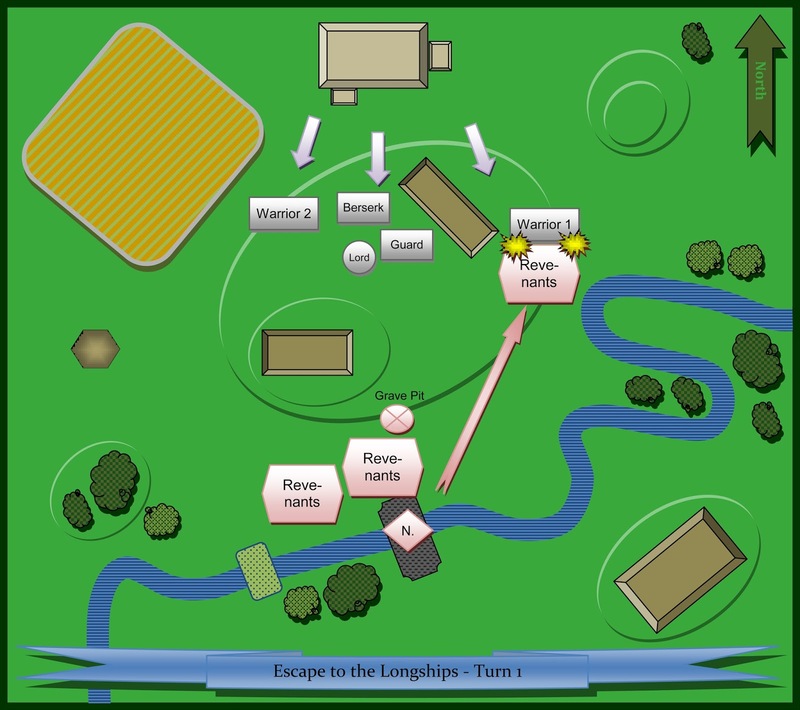 With all their loot intact, it seems like only a short distance and a few zombies stand between the Vikings and a quick getaway. Marching forward with the stolen booty loaded onto horses. 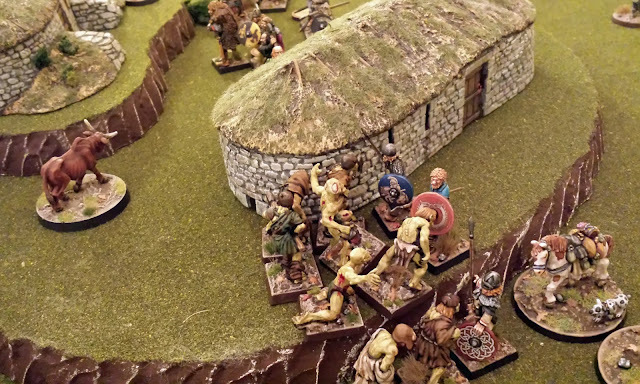 Sensing victory, the Warlord and Viking Warriors rush toward the bridge, but in their exuberance, they fall just short of attack range on the weakend Revenants. This blunder leads to the climax of the battle. The Necromancer had been accumulating Dread Tokens all game long and now uses them to open "The Gates of Hell". He moves the Grave Marker into the Warriors and transforms it into a new unit of Revenants, symbolizing an eruption of new zombies out of the ground. The new Revenants add to their blitz by invoking their "Relentless" ability and the Vikings counter by crying for "Valhalla", which sells the lives of their own soldiers in exchange for greater slaughter on all sides. The Mouth of Hell yawns! The resulting melee is a confused bloodbath. 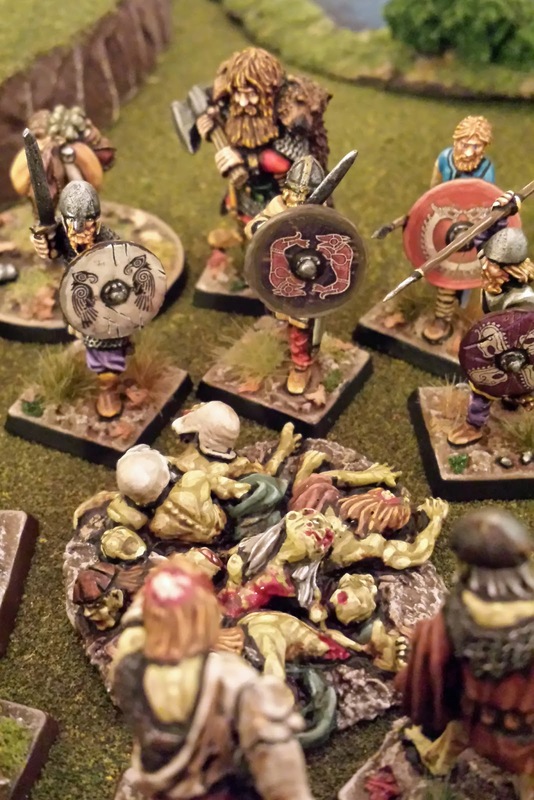 The Viking Warriors are wiped out to a man, but the Revenants also take 7 losses. To revenge themselves, the Vikings unleash "Ragnarok" on their Battle Board, a costly power that lowers the armour of all enemies. Then they throw themselves into one final push. The last Berserker kills himself and 3 Zombies. 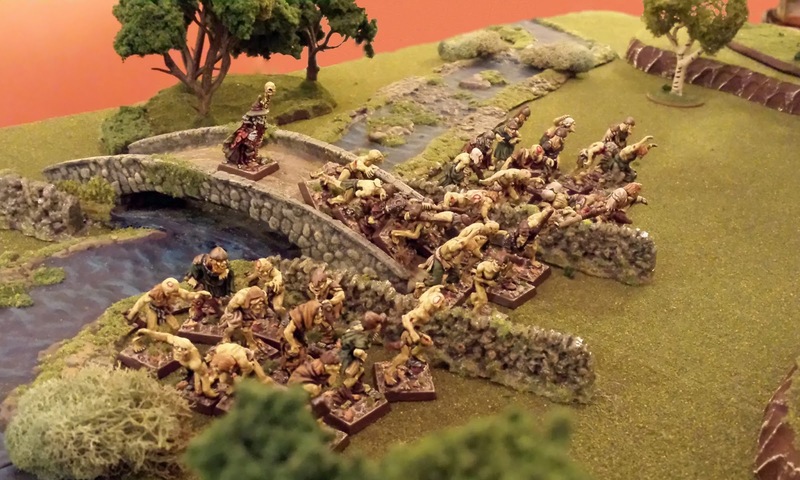 The Warlord makes a thrust for the bridge with his Hearth Guard behind him. And the closest thing the Vikings have to a reserve (the unit of Warriors attacked in Turn 1) march southwards in support. The game now poised on a knife's edge. Most of the Vikings have been wiped out, but the formidable Warlord still stands with a few Warriors at his back. Can his ax cleave a path to the Necromancer through the soft flesh of the remaining zombies? The answer to the question above is "No." The Warlord wades into his enemies and hacks them down right and left. But the fallen just rise again as Revenants invoke "Why Won't They Die" on their Battle Board to replenish their recent losses. The undead surge forward and overwhelm the remaining Hearthguard. Fighting desperately, the Vikings only have their Warlord and one Warrior, facing off against a full unit of Zombies. The Necromancer snipes and kills the Warrior from the top of the bridge, leaving Lord Gaukur alone. By using "Overwhelm", the Revenants are able to mob the Warlord and finally bring him down. I'm consistently impressed with Saga. It's system of activation and fatigue gives players great flexibility to exploit errors or push individual units to heroic activity. 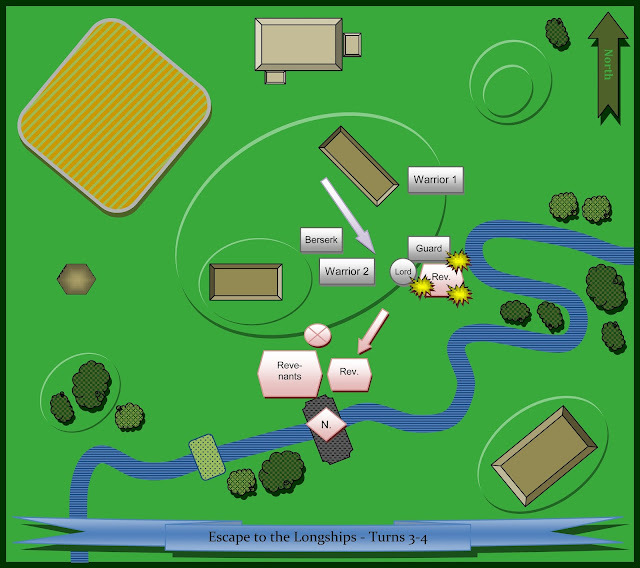 And the Battle Boards (especially the Revenant's Battle Board) add a lot of flavour. 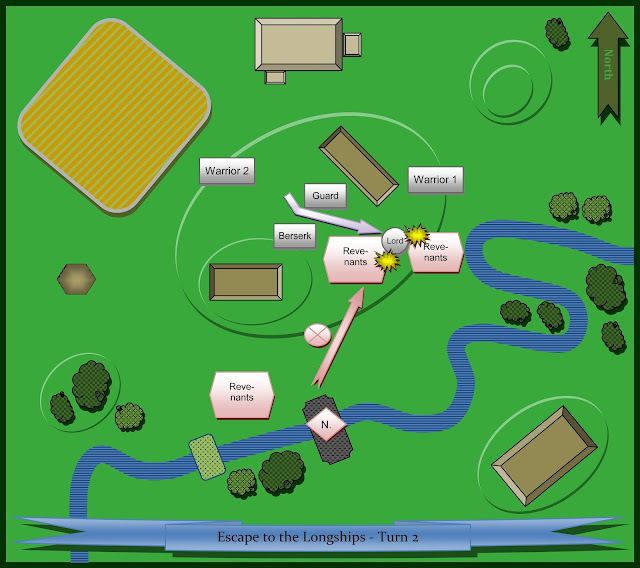 Seeing the shuffling zombies sprint forward, erupt from the Grave Pit or rise from the dead was thrilling and thematic. But I also thought Saga was better for having a referee. The rules are sufficiently fiddly as to benefit from a neutral arbiter who can make snap rulings. Konrad and Matthew played superbly, leading to a game with many tactical twists and turns. For much of the game, it looked like Konrad was in control. But when his final charge fell short of completion on Turn 5, I knew that trouble was brewing for the Northmen. All game long, Matthew's choice to take a Grave Pit instead of a fourth unit of Revenants seemed to be holding him back -- but when he was able to steer the Pit into the vulnerable Warriors and wipe them out in one ghoulish cataclysm, it was all worthwhile. Hail to the nordic draugs! Fantastic lookinf and reading report. Draugs is such a great word. If at first you don't succeed, die, die again. Wow! I was on the edge of my seat. Great game and report. Glad you enjoyed it, Sean! Terrific report! 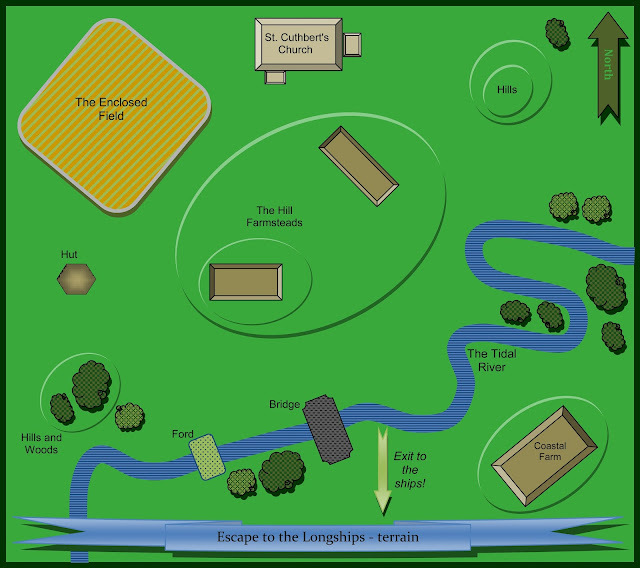 Wonderful maps, figures, write up and terrain...excellent!! I'm glad you liked the maps. 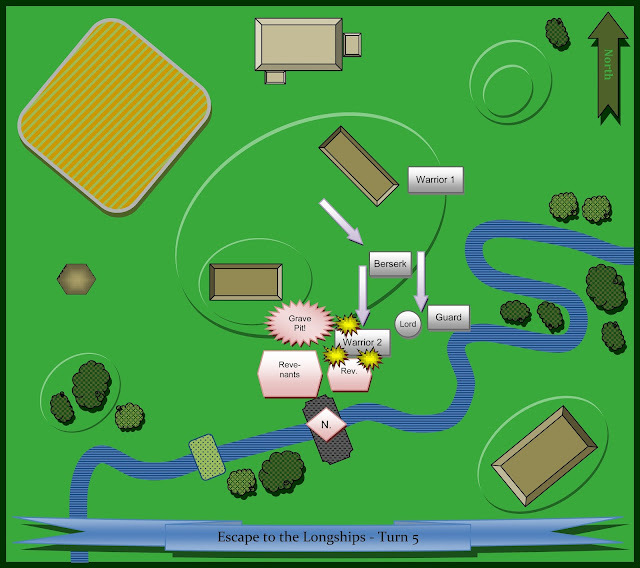 I don't think it's a proper battle report without cheesy green maps. Great report. I like your `zombie skin' I may have to pinch that. I'd love to see what you do with those colours. I've only really discovered Saga last WE with a tournament taking place where I was playing and I have to say it felt very nice. More projects means more time but your report shows it's time well spent for sure ! Saga is definitely worth your time. I'm looking forward to checking out the latest expansion (Aetius and Arthur). Great stuff! Really must get my Revenants painted up and actually give SAGA a go! I'm glad you got a set while it was still available. I still don't completely understand why it was such a limited release. Fantastic battle report! The maps were reminiscent of the old GW battle reports and they helped me keep a clear picture of the battle in mind. The scenery and figures help to make it more compelling. Congratulations! 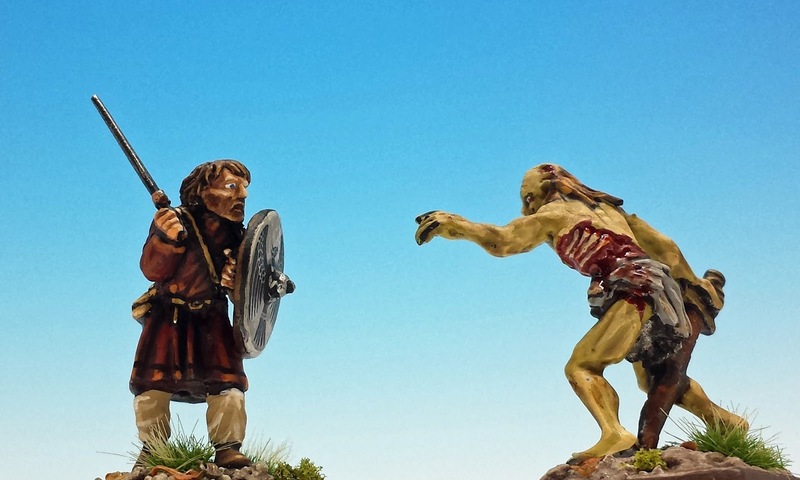 You made a great and mad battle with fantastics miniatures. A really impressive post that really brings the battle to life. Great stuff! I'm happy to hear that it seemed, vivid, Thomas. It's always hard to know how much detail to include. Ok, that was frikken epic. If only one of the Norsemen had survived, a grand saga would have been written of their ill-fated exploits here. Sadly, instead they will be risen again and added to the Necromancer's shambling horde. That's the beauty of the undead, isn't it? You struggle, your strength fails, and you join the mindless mass. It's like adulthood. Your simile hurts like a fist. Fantastic stuff, Matt! Beautifully painted figures, with great terrain and maps. Do you use any special program for the maps? I haven't been able to take my revenants for a shamble yet. 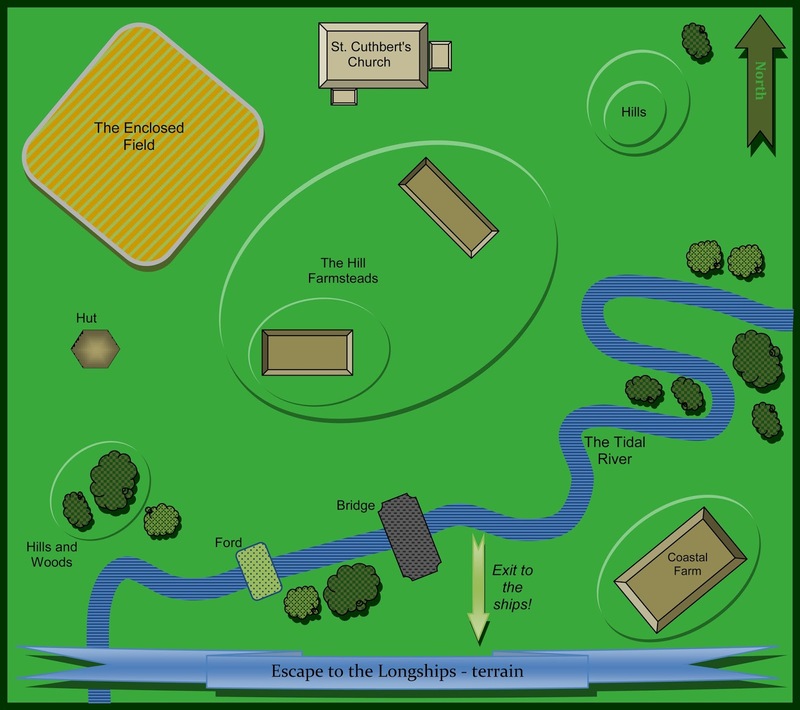 I just use Microsoft Word to design the maps, using "shapes" and various text boxes for the units. It's primitive, but gets the job done. Loading these maps onto Blogger takes a little work - I save the Word docs as PDFs, then open the PDFs with Photoshop, which lets me crop them and save them as JPEGS. There's got to be a better way, but I'm not too computer savvy. Oh, wow, extra marks for effort! I've dabbled with PowerPoint, it's a shade easier.